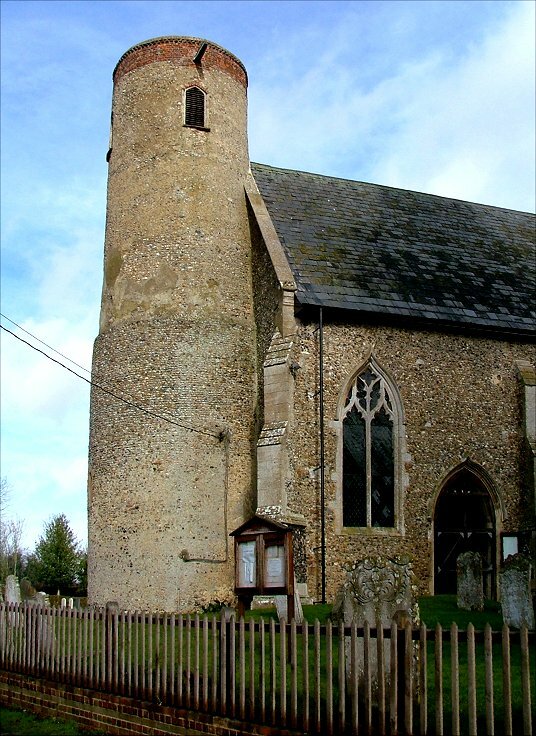 This big church sits in its pretty village less than a mile from the town of Long Stratton's anonymous suburbia, but still has a thoroughly rural setting. The tower narrows considerably, and is clearly in two stages, probably three. The lowest stage is almost certainly Saxon. But the church built against it is something quite singular. 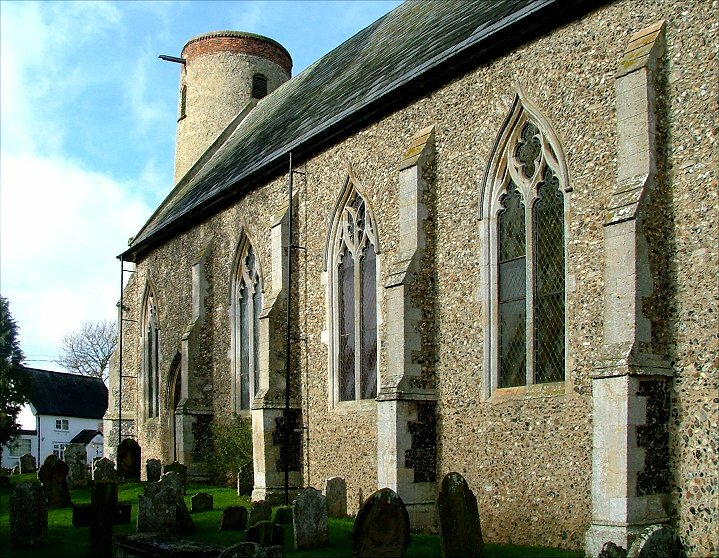 The narrow graveyard accentuates the sheerness of the walls, a long, tall, narrow nave and chancel in one that is pretty much as it was when rebuilt, on the eve of the Black Death. By the later decades of the fourteenth century we stopped building churches like this, and the colder rationalism of Perpendicular would take over from the mystery of Decorated. All Saints captures the moment before this happens beautifully. What would have happened if the Black Death hadn't arrived? European architecture fragments at this moment, and probably Christianity would not have become such a serious business. Something of the joy goes out of European culture in the middle years of the fourteenth century. What is this building like inside? When I first wrote an entry for it I answered my own question in just two words: no idea. 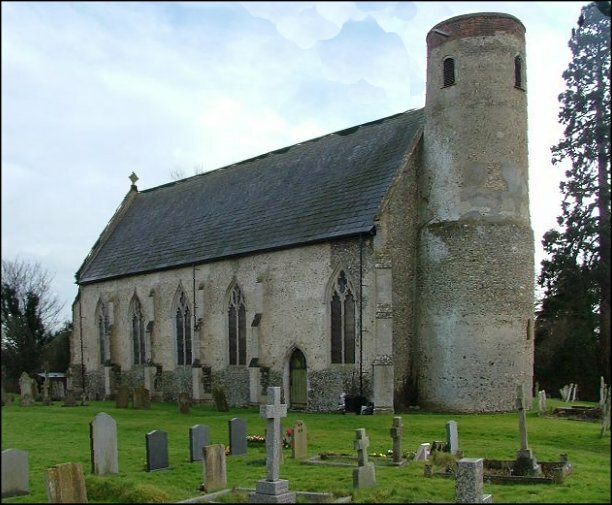 All Saints was well-known by East Anglian church explorers for being pretty much completely inaccessible. It was not popularly known as Fortress Wacton for its looks alone. But, as Bob Dylan was wont to observe from time to time, the times they are a-changin', for I was excited to discover that All Saints was taking part in the 2010 Open Churches week. Peter and I hurried up the A12 and out into Long Stratton's hinterland. The sign on the gate confirmed the rumours, and we opened the door into - well, what do you imagine? I have noticed that often it is only the dullest, most over-restored churches which are kept locked from one Sunday to the next, but I can reassure you that this is not the case with All Saints, Wacton, for this is a fascinating and very lovely church, which deserves to be so much better known than it is. The lovely brick floors, the airy tracery of the screen, the substantial 15th Century font which would not be out of place in one of Norfolk's grand, urban late 15th Century churches, all conspire to an interior which is rather breathtaking, actually. I was pleased and excited to discover it, and perhaps a little cross that other people hadn't been allowed to explore it too. But taking part in Open Churches week is a step in the right direction, and I hoped it might encourage the parish to embrace the radical idea of being open during the days of other weeks as well. There are some intriguing ledger stones of the Commonwealth period set in the brick floor around the font. They are entirely secular except that of the 26 year old John Eley who died in 1647 in hope of resurrection unto life. Almost a century later, a mural tablet remembers that Mary Baker, daughter of the Rector was Wisest, Virtuousest, Discreetest, Best. The mason has had the grace to correct his spelling mistake in the second word. Two features were outstanding for me. One is the roundel of 17th Century continental glass depicting Christ with the Apostles, which I am afraid is impossible to photograph because it is in a perspex casing. The other is the excellent 1623 brass inscription to Abigail Sedley, the daughter of John Knyvett of Ashwellthorpe - can there be a more beautifully lettered brass of that decade anywhere in Norfolk? At one time, it would have been in the floor of the nave or chancel. Now, it is screwed to the south wall, and if there is ever a fire here it will melt away like so much butter.